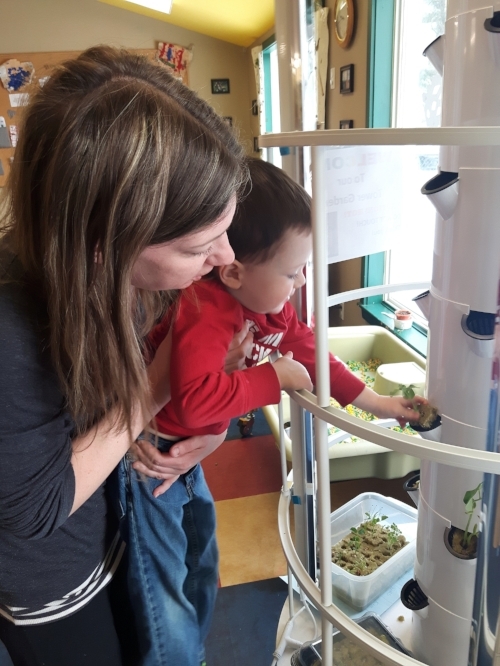 Have you been interested in the progress of our Tower Garden? You will be excited to know that our seeds have sprouted into seedlings and are ready for transplanting. "Look our seeds are growing!" After we planted the seeds, they were placed in trays for sprouting before they could be transplanted to the Tower Garden. Once the seedlings roots reached ½ - 1 inch they were ready to be moved. The Senior room children were very excited to see their seeds were growing and had the opportunity to help move them into their new home in the tower. "I want to plant the tall one!" "I want to plant the peas!" "I want to plant one up high!" Our tower is made up of 7 sections or levels and each has 4 pods. The children were able to learn about each plants placement and why they needed to be in that section. For instance vining plants work best on the bottom section 1 where as chard and celery work best on the top section 7. With herbs, greens, peas and beans in the levels between. As the roots begin to grow we will keep moving them to the tower!